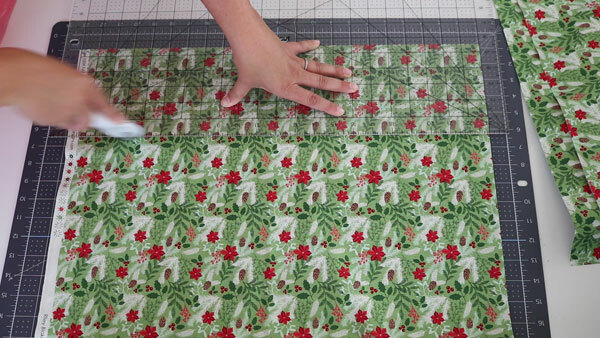 Welcome to the 3rd part of this video and quilting series! 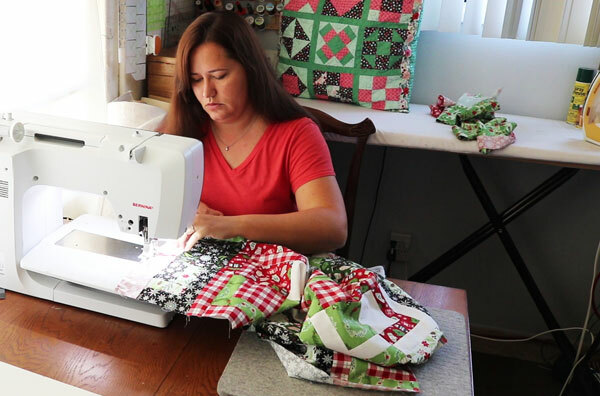 Over the past weeks I have been working on making a Christmas Quilt using Riley Blake Fabrics and the Cricut Maker. In Part One I showed you how I selected the fabric and pattern. In Part Two I showed you how all the pieces were cut. 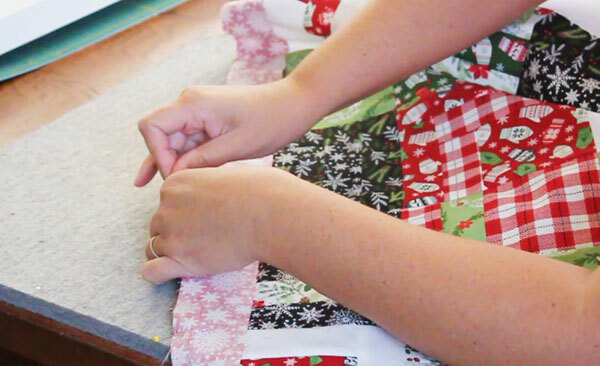 And today… today we are piecing the Half Log Cabin Throw quilt top! To finish up this series I’ve created another video. This video is long, but oh-so-comprehensive! 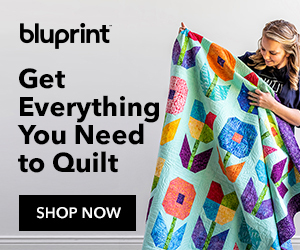 I’ll be holding your hand and taking you step-by-step through how to make this quilt. It is always more fun to make a project with a friend, and I hope you’ll stitch along side me as we make this quilt together! We’ll make the units, put together the blocks, build the rows, and stitch up this quilt top. When we get to adding the borders, I’ll give you some tips on how to get a nice smooth border with no ruffles! If you’d rather read along, I’ll lay out the basics of making the quilt here. 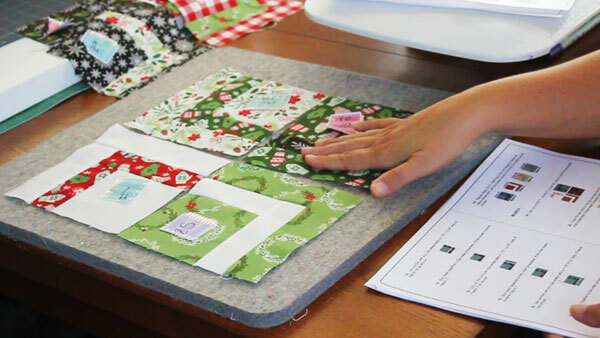 Remember that a full set of PDF instructions is in Design Space that will also help you in making the quilt. We’re going to start by laying out all of our fabrics. The inner border, outer border, and binding fabric can be put aside. 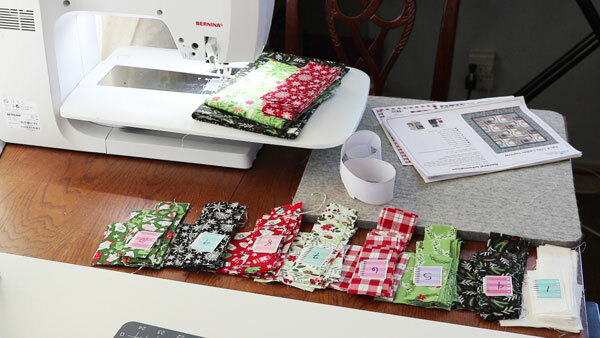 Label the other fabrics by fabric number to make it easier to grab the right fabric as you lay out the block units. 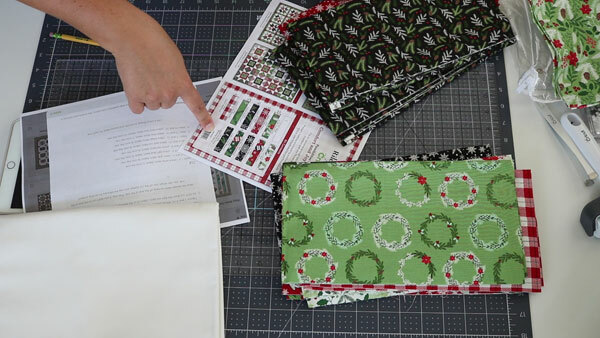 Using the PDF instructions, grab a square of fabric one and the smallest rectangle in fabric 8. Place them right sides together and stitch. Then press your seam towards the dark. Add the next size up of fabric 8. Stitch and press. Repeat with the same size of fabric 1, and then the largest strip of fabric 1. You’ll have your first block unit complete! Repeat the process for all the block units – you’ll be making 6 of each. Check the PDF for all the fabric combinations. If you watch the video, I’ll show you how you can save time making these units by strip piecing. 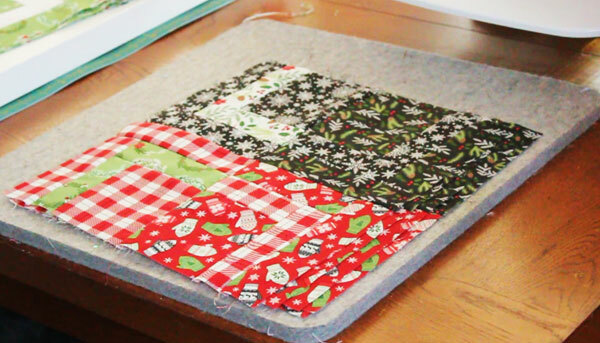 Once you have all your block units, lay out block A. Stitch the top and bottom units together. Press the seam to the right. Repeat with the bottom two units, pressing the seam in the opposite direction. Then stitch the top and bottom together. You can press the middle seam up, down, or spin the seam (watch the video and I’ll show you this technique)! Make 6 of this block (Block A). Now you’ll follow the same steps as Block A, but to make Block B. Which is the same, but with different fabrics. Once your blocks are done, stitch them into rows! You’ll have 4 rows, each with 3 blocks. 2 of the rows have a block A flanked by block B on either side. The other 2 rows are block B flanked by Block A on either side. Press the seams of the first row in one direction, and the seams on the other row in the other direction. Then stitch your rows together (alternating the A row with the B row), and press all the seams in one direction. Your blocks are all together! Now it is time to add the borders! I want to share my special border-adding tip with you. First we’ll be adding the side borders. 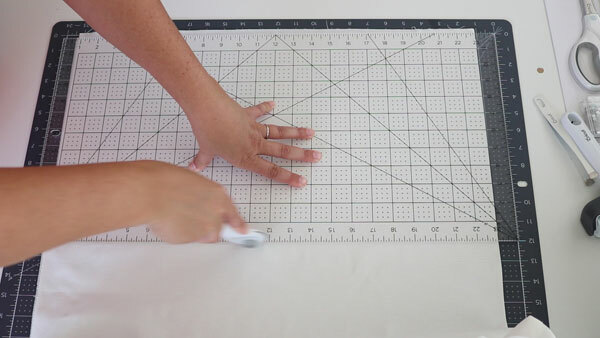 Measure both sides of your quilt, then measure the center of your quilt from top to bottom. This tells you the height of your quilt on both sides and in the middle. Add these 3 numbers together then divide by 3. That is the size you should cut your side borders. This will keep you from having wavy borders. Pin the border in place. First by pinning each end. Then pinning the middle. Then pinning along each half so that the border is smoothly in place. Once it is pinned, you can stitch. Repeat the process of measuring the top, bottom, and middle to cut the top and bottom borders to size. 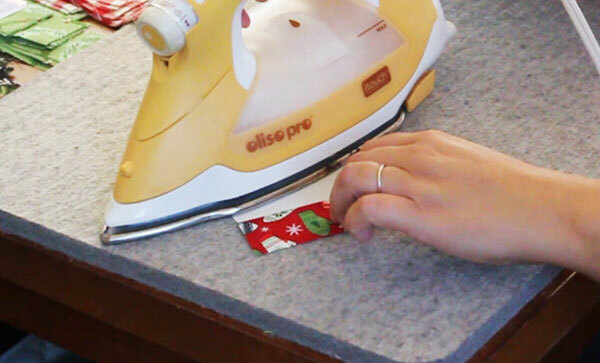 Pin them the same way, then stitch. 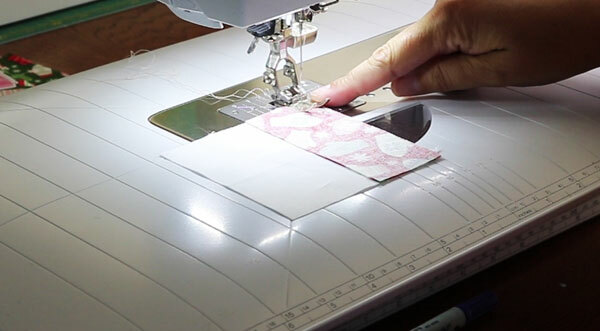 Repeat all these steps to cut, pin, and stitch on your outer borders. Once your borders are on, your quilt is done! This quilt has been so much fun to put together – I hope you enjoyed it, too! I’m considering putting together a bonus video to show you how to quilt this lap sized quilt on a domestic sewing machine. But if you prefer, you can absolutely have a long-arm quilter do the quilting, and then you just have to bind it. 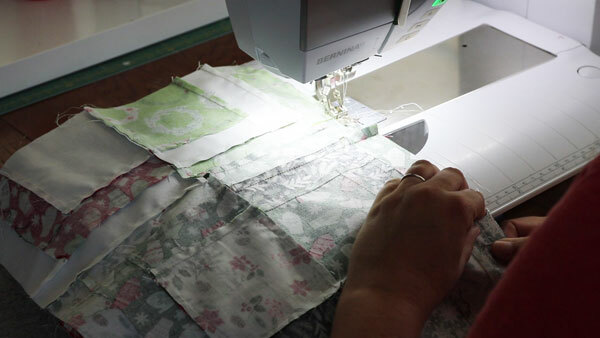 You can search this site for lots of tips on quilting your quilt, and binding it! Thanks to Cricut and Riley Blake for asking me to put together this series! 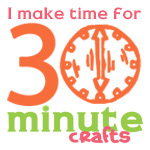 I can’t wait to show you more quilting and crafting fun! 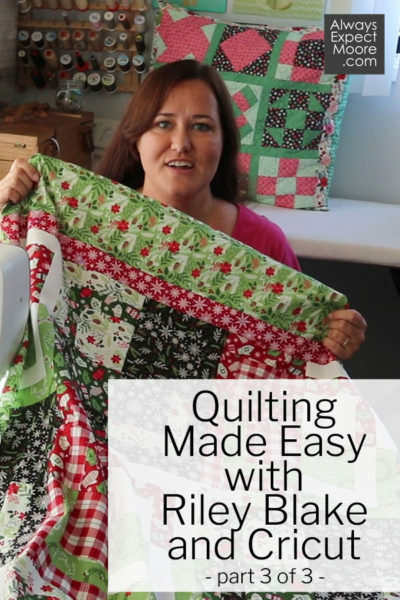 I’m excited to share part 2 of my “Quilting Made Easy” series with Riley Blake and Cricut. 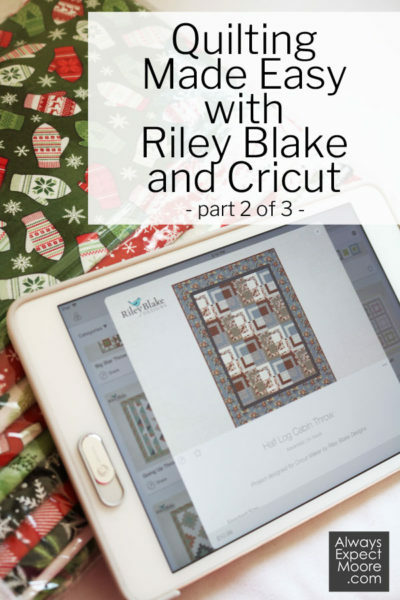 When Cricut offered to send me a Riley Blake quilt kit of my choice to share with y’all, and show you how easy it is to whip up a quilt when Cricut takes care of the bulk of the cutting, I was excited! 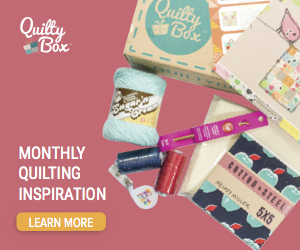 I love sharing innovative ways to approach quilting, and these quilt kits are a fantastic way for both beginners and experienced quilters to put together quilts that look beautiful every time! Last week I showed you how easy it was to pick out a fun fabric kit, and to pick a pattern to go with it. Today I’m opening up the pattern and doing all the cutting. If you’d like to read through the steps, I have you covered as well. First, let’s talk tools. Cricut has some great kits that are perfect for doing all the pre-cutting needed. 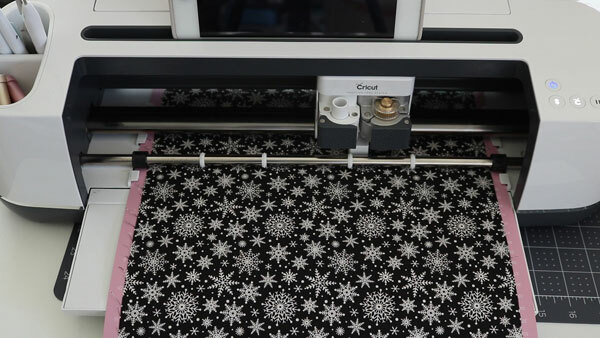 They have a rotary blade, ruler, and mat set that is exactly right for cutting those large 12″ wide strips needed for the Cricut mat. 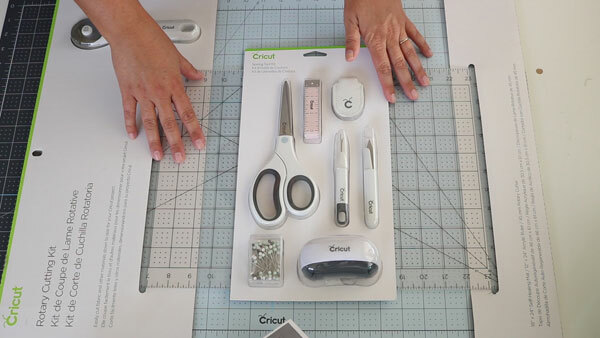 Be sure to check out the Cricut cutting tools – they are the experts when it comes to sharp blades that cut well! Start by removing the fabric from the zippered bag it came in (by the way, this zippered bag becomes an awesome shoe bag for traveling! ), and pull out the paper it came with as well. I also printed a screen shot of the cutting instructions, since those are not available as a PDF. I put all the fabrics in order – fabric 1 through 11. I removed fabric 11, which was the 3/4 yard piece of fabric. Beware, it is the exact same as fabric 4, which is a 2/3 piece. Make sure you’re setting aside the 3/4 yard piece which will be used for the binding later. From fabric 1, cut two 12″ wide strips. 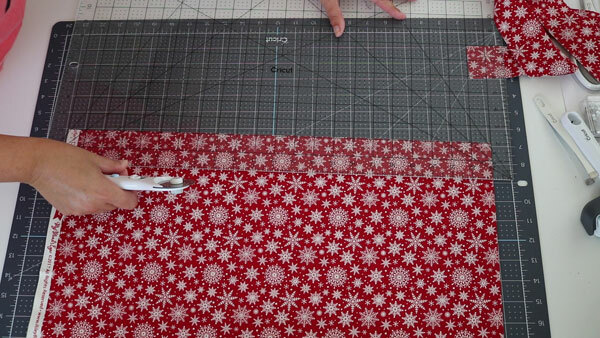 Cut fabric 4 into two 1/3 yard pieces (1/3 yard is 12″, so you’ll be cutting it in half to make two 12″ strips). Then from your inner border fabric (fabric 3) cut 5 strips, each 2″ wide. 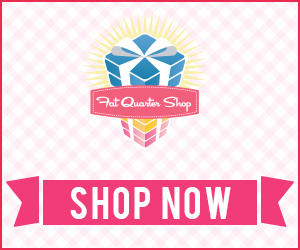 From the outer border fabric, cut 5 strips, each 5.5″ wide. 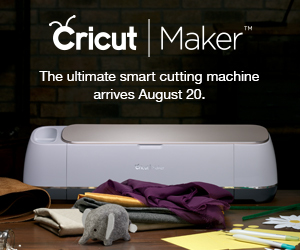 I know what you’re thinking – this is supposed to be all about how great the Cricut machine is for cutting fabric, and we haven’t even pulled out the Cricut machine yet! Yes, that is true. The Cricut Maker is great for cutting fabric. But for some projects, a little pre-cutting is needed. There are 11 fabrics in this kit. We have pre-cut 4 of them, and put a fifth aside. Now we are ready to pull out the Cricut Maker to do the rest of the cutting for us! Start by placing the fabric on the mat. Float the fabric over the pink mat until it is lined up on the edges, and the top edge is above the top cutting line, but below the top edge of the mat. Then press it down. You can use the brayer to secure it if you like. Now you are ready to get cutting! 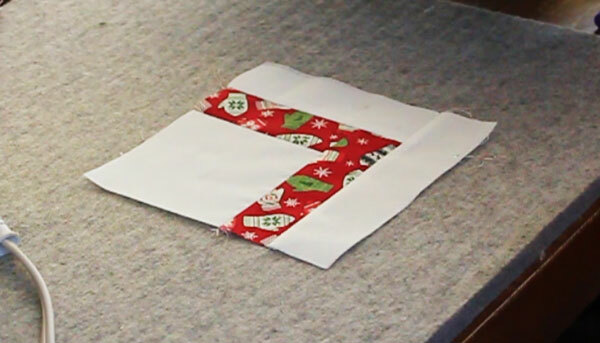 For most cuts, you can use a single strip of fabric for 2 mats. The first mat is a 12×24″ mat. Place the fabric on the mat. Then trim off the extra fabric from the bottom. Put this on a 12×12″ mat (or on a 12×24″ mat – you can always use a larger mat) for the second mat of that fabric. Fabric 2 – Outer border – was cut into 5.5″ strips in an earlier step. Fabric 3 – Inner border – was cut into 2″ strips in an earlier step. You probably noticed that all those fabrics are NOT in number order. This is because we want to make sure that our light and dark fabrics are balanced in the quilt. Each quilt has those lights and darks set up in a different order, so the cutting order for the fabrics can change. 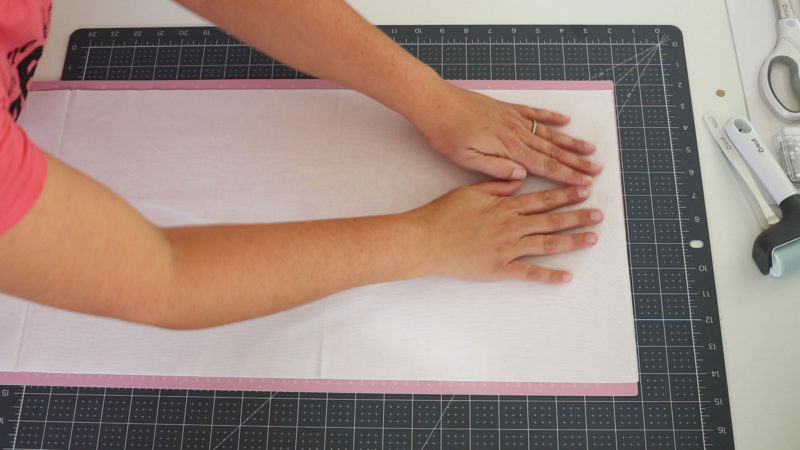 Once you have your first mat ready to go, you can start cutting the rest of your fabrics! It is lovely to cut it with the Maker, because once you have the mats and fabric in order, you can let your mind wander. When cutting with a traditional rotary cutter and ruler, I have to be vigilant and remember to “measure twice, cut once” or risk a mis-cut! A miscut can mean a waste of fabric – possibly running out of fabric if the miscut is bad enough! I didn’t have that issue with the maker. I kept feeding in the mats in order, and could even hold a conversation with my 6 year old while getting all the mats cut – and I never had a miscut! I’ll be back in TWO weeks with the third installment of this quilting journey. 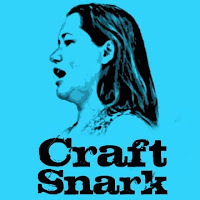 Next week I’ll be off at the Cricut Mountain Make-a-thon teaching a class on “How to Design a Quilt Block like a Pro” as well as learning from some of the other fabulous ladies (and gentleman) who are teaching at the event!